How News of Bin Laden’s Death Has Reverberated Around the U.S.
As the world digests the news that Osama bin Laden is dead, we collected reporting from public media outlets for a glimpse at the conversations taking place around the nation about bin Laden and the post-9/11 era. John Radsan, director of the National Security Forum at William Mitchell College of Law and Michael Hurley, President of Team 3i, a national security and counter-terrorism consulting firm, discuss the future of the war on terrorism and al-Qaida on Minnesota Public Radio. WTTW’s Chicago Tonight asks a panel of experts: Are we safer now that the world’s most wanted terrorist is dead? The Council on American-Islamic Relations, a Muslim civil liberties and advocacy organization, is one group that has expressed relief over the end of the hunt for bin Laden. KPBS talks to leaders from the group in San Diego and KQED talks to the Bay Area chapter leader in San Fransisco. 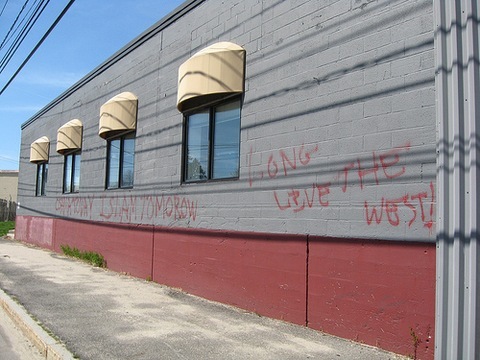 A mosque was vandalized in Portland, Maine, on Monday morning with anti-Islamic statements, as Maine Public Broadcasting Network reported. Almost everyone has a similar first reaction. They want people to know that the Muslim community denounced Osama bin Laden and the 9/11 terrorist attacks. Austin’s KUT talked to U.S. military personnel stationed at Fort Hood in Texas about what bin Laden’s death means for them. Most couldn’t predict much of a change in the near future operations. Listen to the story here. At Camp Pendleton in San Diego, Marines were feeling “happiness and pride tempered by worry” according to KPBS Home Post blog. Read some of the military wives’ reactions as well as those of the Marines stationed there. Ground Zero, the Pentagon and the site in Pennsylvania where Flight 93 crashed have become places where many go to reflect on the fight against terrorism. PRX features five interviews with people at Ground Zero, the morning after bin Laden was killed. WBUR’s Radio Boston talks to a number of Bostonians about the recent news including a woman who lost her son in the attacks on 9/11 and some military personnel. Most students who are graduating from high school this spring were in third grade on 9/11. Some high school seniors in Minnesota reflect on growing up in the shadow of that tragedy. Listen to the story from Minnesota Public Radio. For many families of 9/11 victims, Sunday’s events brought a measure of catharsis. Dr. Harold Bursztajn, co-founder of Harvard Medical School’s Program in Psychiatry and the Law, talks to CommonHealth blog about the sense of relief many are feeling. Read a blog from a researcher for NOVA about the use of DNA in identifying Osama bin Laden. American Public Media’s Marketplace looks at the economic impact of bin Laden’s death. And Exeter University professor Bill Tupman says that if al-Qaida is a franchise, then bin Laden’s death should not have a strong impact on the organization’s ability to finance. The killing of Osama bin Laden came at a time when national security and defense budgets are contracting. Nightly Business Report has a story on the economics of the war on terror. KQED archived a list of the initial tweets from @ReallyVirtual, the Pakistani who inadvertently live tweeted the raid in Abbottabad. Read a list of the top five ways Osama bin Laden changed U.S. immigration policy from the Multi-American blog.